Cove Haven Entertainment Resorts is a group of 3 couples-only resorts nestled in the scenic Pocono Mountains. Their only problem was that people weren’t exactly sure where they were or how the resorts were connected. 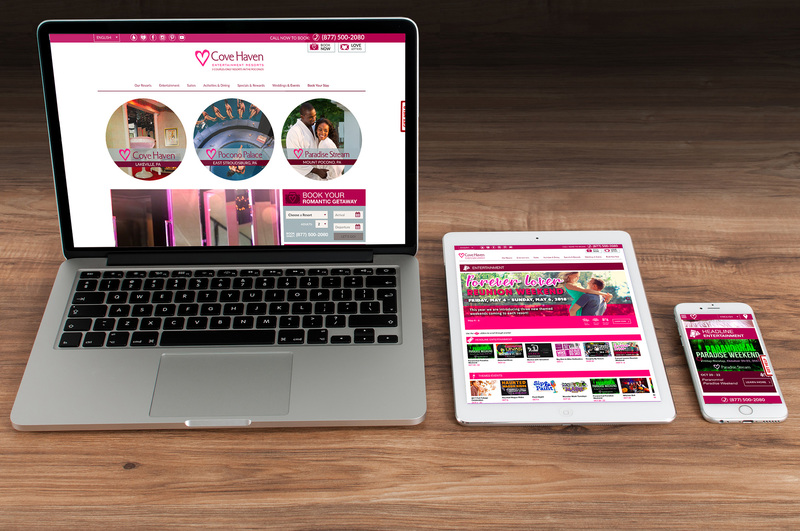 Our mission was to not only redesign their website to be clean, modern, and more inviting to a younger demographic with integrated video content, but to also work with their marketing team to make the relationship between the resorts and their amenities more apparent. We gave the existing website an overhaul that pushed more room bookings while providing consistent and timely website support and updates. We also provide design support for a variety of resort signage and activities.